Still a very young wine with just a hint of brick colour at the edge of the glass, with a medium purple colour in the centre, not as dark as some Gevrey Chambertin wines. The nose is big and earthy with hints of forest floor and even a touch of truffle when the glass is left to sit and brood for a while, great nose. The palate was a little tight with the fruit hidden behind some mouth filling tannins, would have thought the fruit to be more pronounce the when tasting next day, it wasn’t. Should be an interesting drop when I next visit this in about a year’s time, I’m expecting the fruit to have developed. We stumbled on this wonderful Domaine wandering around the town of Gevrey Chambertin when visiting Burgundy a couple of years ago. The Domaine is set is very pleasant ground in the heart of the town. Well worth a visit as not only is the wine good, the prices are very reasonable and the owners are very helpful and they ship to Australia and there is a really great restaurant around the corner, Chez Guy. A wine blended from 66% Cab.Sauv, 13.5% Malbec, 10.5% Merlot, 5.5% Cab.Franc, and 4.5% Petit Verdot. The nose shows beautifully soft but very up front wood and fruit that you could mistake for a Margaret River Cab Sav but without the EH (an Acepfv descriptor). The palate explores more of that subtle wood that just fills the mouth without overpowering everything else while giving a backbone to some wonderful fruit. Dark Berry fruits that is long on the finish with a touch of acidity to help keep everything in balance. Very impressive, thanks to The Frock Salesman for going out on a limb and choosing this. I have two bottles of Château d’Yquem 2001 waiting for a special occasion, so it’s not about price. As some may be aware I’m not a big fan of South Australian Shiraz, but Grange is an exception to the jammy Shiraz that so often comes out of the Barossa, at a vertical some 14 years ago the impression left was of a subtle well balanced wine that had a good sense of itself. Compared to the Yattarna Chardonnay we tasted at the same vertical, which can be best described as schizophrenic in style, the Grange had true consistent style and quality to match its price tag. As the famous Professor Julius Sumner Miller1 often asked, “why is it so”, well there’s more than one answer or reason to the question of its absence from my cellar (apart from a bottle belonging to Cookie). The most telling reason would be Terroir2, Grange has none. I can still remember the Penfolds winemaker at the time of the vertical, telling the assembled samplers of the monumental effort that went into selecting the wine from all parts of South Australia and feeling perplexed by this, not amazed as one should have been at their Herculean effort! This was a first stirring of the subconscious desire for that elusive idea of Terroir, without even knowing the word or concept. There was a feeling that what helps make wine special is the relationship between where it is grown and what is in the bottle. 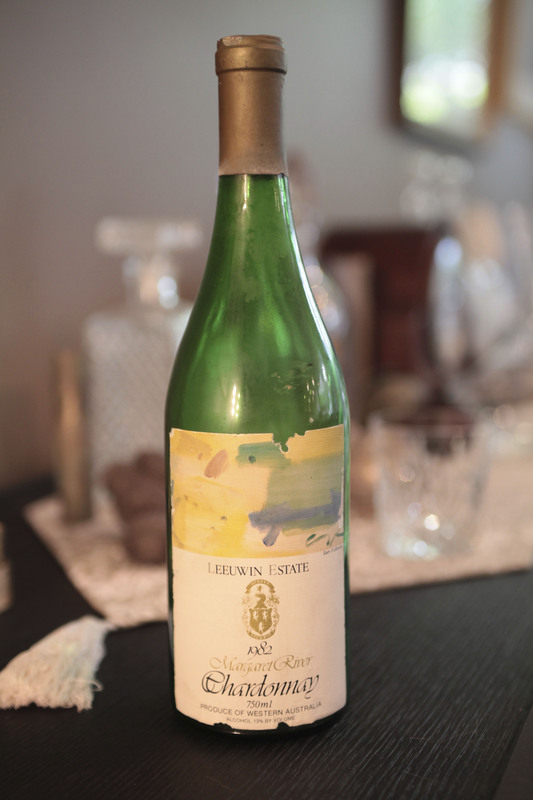 An example of this is one of my favorite wines back then, Leeuwin Estate Art Series Chardonnay (still is a favorite) a wine produced from grapes grown from one very particular part of their estate. Not only is it a lovely and complex wine but it also has Terroir and over the years knowledge of its Terroir grows as you get to know the wine and its reflection of the particular little place in Margaret River and its varying vintage conditions. Terrior is why we visited Craggy Range on our recent rugby trip to New Zealand. Craggy Range only produces Single Vineyard Wines, with the added element that these vineyards are in a diverse range of wine regions in New Zealand. You can drink a Syrah from their Gimblett Gravels Vineyard or a Pinot Noir from the Fabulous Calvert Vineyard in Central Otago. 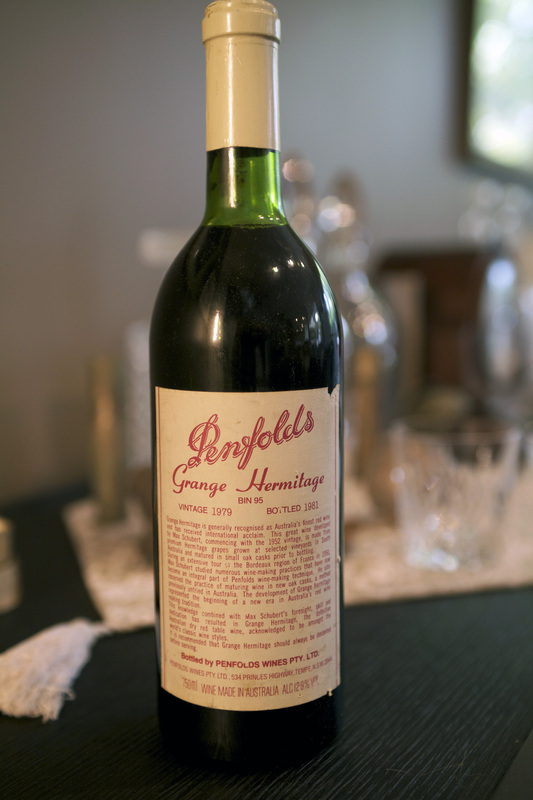 Unlike the above wines Grange can come from any of a multitude of vineyards that Penfolds owns or is supplied to by its growers within the great state of South Australia. This ability to source grapes from such a large pool produces a great wine. But it lacks Terrior, there is no reflection of where it was grown and the micro climate that produced it. So what if the wine comes from all over the place, if it tastes good, why care. That’s easy, “A sense of place” and the personal connection to that very specific place. To be Continued – more on A Sense of Place and the Hula Hoop Theory. A while back we had a 1998 St Hugo supplied by Acepfv and that was drinking perfectly showing distinctive aged notes, this was young in comparison and gives a good benchmark on how bottle age changes the character of this wine. It did still drink well with a youthful nose of fresh dark berry fruit and vanilla oak, probably could have done with decanting, a worthwhile wine if you want to drink now or buy a few bottles and watch it age and change character. If you don’t know yet, I will just remind you I’m no big fan of South Australian Shiraz, too often they are too big too jammy for my liking, whether it’s because of the weather being to hot to grow shiraz or just the style that some wine makers prefer I don’t know. This one is from McLaren Vale, which has a cooler climate than the Barossa and maybe better suited to Shiraz. Ray Jordan from the The West Australian newspaper sums it up better than I can. Will have to hunt out some other examples of McLaren Vale Shiraz and see how they compare. To chilled and still to young, tasted like a cigar box that had been stored in the fridge, at least that’s what I thought of while drinking this. Should have planned better and pulled it from the cellar and decanted a couple of hours before drinking. 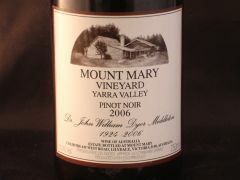 Also from the cellar, but being a Pinot Noir this wine can be drunk at 150c without hindrance. Even though this was the last in a long list of wines, it was the star of the night, lifting a tied and distracted palate (watching Australia v Wales Rugby match) into an explosion of mouth filling Pinot fruit. This is a wonderful expression of Gevrey Chambertin Village wine that captures the bigger more masculine style that Gevrey is renowned for. For a humble villages wine this was punching above its own weight with still strong fruit and hints of forest floor, way better than the previous bottle of 1999, the variation in wine under cork is truly amazing, why it is still used I do not understand. A seductive and unusual blend of Marsanne, Chardonnay and Roussanne described by the winery thus. ‘The primo amigo in this trio is marsanne, grown at the McLeod Creek and Calgardup Brook vineyards. Chardonnay is sourced from Rocky Road and the third amigo, rousanne, is grown at McLeod Creek. These vineyards lie in the southern half of the Margaret River wine region which has a strong maritime influence from the Great Southern Ocean. From the cellar, purchased directly from the winery $25.00 a bottle in a Dozen, this was the last bottle, will have to stock up with the 09 as it is an absolute bargain. Now you can’t go wrong with a Howard Park and we certainly didn’t with this little gem, a very elegant Chardonnay that displayed subtle fruit and mineral qualities, I would need to go back to another bottle to describe this better as cooking was taking up my time and others had their eye on the wine and it did not last long. Supplied by the Gardener, approx. $45.00, a good value mid range Chardonnay, you could do a lot worse at this price point. An enjoyable well structured Pinot that was probably needing just a little more bottle age to open the fruit up a bit, would look at it again to see if I prefer the style of Stefano Lubiana’s wines as an expression of Tasmainian Pinot. Would have to agree with that, it was a tight ball wrapped up in tannins and needs time in the bottle or an hour or so in a decanter if you can’t wait. One of the great things about Central Otago Pinot is that even when the wine needs time to open up to its full potential they are still relatively approachable compared with most age worth Burgundy. Supplied by the Frock Salesman, he purchased this from Mt Difficulty on our recent New Zealand Rugby/Wine trip and cellared it for a total of 2 months. Or, reader warning for the squeamish or vegetarian at heart. Back to the Old Brewery for what is usually a bit of a meat fest, surprise, surprise, it turned out that way. With what has to be Perth’s best list of Meat inspired dishes it’s actually no surprise. Started with what else but Lambs Brains with a Sweet Potato Puree and a Muscatel Jus, would never have gone near any of this when a youngster, would have tried to feed it to the family dog, how things change, nowadays always on the lookout for this delicate, delicious dish that melts in the mouth when cooked just right and this was. This was followed by the Pork 350gm Rib Eye (with crackle) from Plantagenet Western Australia and a side of Roasted Bone Marrow now if the family dog were around she would have been begging for one of these superb morsels of marrow with their jelly like texture and moreish flavour. The pork rib eye was beautifully cooked and tender as. The crackle was a disappointment, my guess is that it was oven roasted and being cooked separate from the meat it ended up crispy but rather tasteless, adding a little more salt and some duck fat would have made a big difference to the flavour. The other Wednesday Wine Club members started with the Crispy Soft Shell Crab with chilli lime sambal, looked divine and a very generous serving to boot, followed by the pork as described above and the 300g Sirloin – 100 day grain fed from Kilcoy Pastoral Company from the South East of Queensland. From their feedback all was above average and the Sirloin got a special mention as the last couple ordered have not been as good as they should have been, especially as one of these come from a Perth Restaurant that usually doesn’t miss when it comes to their beef. Ordered the Petaluma Coonawarra Merlot 2006 with 5 years age on it, the thinking was this should be drinking well now, it didn’t! We might as well have been sucking on a cigar box as the oak was so overpowering and there was no fruit in sight. It did open up a bit by the last glass and in hindsight we should have requested it to be decanted for later as an hour or so in the decanter would have done wonders. This was followed by a Howard Park Leston Cabernet Sauvignon 2009 ordered by The Gardener, very much a drink now wine. So we got them in the wrong order didn’t we, we should have drunk this one first! Very approachable without being overly fruit forward, avoiding that raspberry cordial flavour and the tannins were well under control. As we keep saying “you can’t go wrong with a Howard Park” good example of a Margaret River Cabernet Sauvignon that will age but can be drunk now, well done Howard Park. Looking forward to our next visit, which hopefully wont be too far in the future. Corked, the wine was that bad it didn’t touch my lips, Cookie was foolish enough to try it and had to spit it out! Shame as this is a great value wine that is drinking well now and should do so for a few more years. From my Cellar purchased for $25.00 from the winery direct. Still going strong, colour is very dark purple with only a small amount of brown tingeing the rim, still looked young for a 13year old Shiraz. Cedar oak is there with more of the plum and dark berry fruit showing through on the nose and into the palate which is long and more refined than can be the case with a 90’s South Australian Shiraz, this is not one of those fruit bombs made famous by an American wine advocate. From the Cellar purchased so long ago I don’t have a record of the price, purchased from Vintage Cellars when they sold good wine and had knowledgeable staff. This was consumed at Sorrento Restaurant1 in Northbridge (must do a blog on this iconic restaurant). It should be pointed out that the wine was a done deal before I even got to sit down, the gardener and JA had ordered this and the next wine while I parked the car. Unsurprisingly both wines were excellent choices (that why it’s the Wednesday Wine Club). The leeuwin was very much a typical Margaret River Cabernet Sauvignon with an earthy nose balanced with a good amount of oak and berry fruit, big on the palate, it most defiantly needs food with it and went well with the Oysters Kilpatrick. As the bin 60A sells for around the $500.00 mark, the bin 389 will be my benchmark for this style for the foreseeable future. It is a very distinctive style of wine and if others see it as Australian that can’t be a bad thing. Or. A Sommelier! a Sommelier! my kingdom (I don’t actually have one) for a Sommelier! It’s not usually my style to give scores but I couldn’t help myself with Modo Mio. On my 3 point scale (devised just now so I can write this blog entry) they scored 1½ out of 3. The food was good to very good but our expectations are so much higher when the restaurant is held up to be at the top end of the fine dining tree in Perth. Started with a small pasta dish of Agnolotti with I think duck confit that was good, although not as good as the Beef Cheek Ravioli with burnt butter sauce and cherry tomato’s from Funtastico2. This was followed by the “Ossobuco con risotto allo zafferano e gremolata” Braised veal shank, saffron risotto, gremolata. The Ossobuco was no better than what I have had at Romany Northbridge3 many times, though the saffron risotto (Risotto Milanese) is probably the best I have had, as good as or better than any eaten when in Milano and the Milanese do take pride in their risotto. Overall there are many Italian restaurants in Perth doing as good if not better simple Italian food. That leaves no points for service, service gets a big fat zero, for the very simple reason the wait staff were not knowledgeable about the food and totally ignorant about the wine. Being pleasant, courteous and prompt doesn’t make up for a lack of knowledge. First a bit about the wine list and in particular the Italian Red wines. Whoever put this list together has a love of and knowledge of Tuscany and its wines. Even though the list is short, 18 wines in total and of those 11 are from Tuscany. Only 11! But what a representation of this wonderful region of Italy, there are Super Tuscans4 of differing grape varieties and style, a few from Chianti5 a Brunello di Montalcino6, the only wine missing was a Vino Nobile di Montepulciano from Montepulciano7 and then it would have been a perfect list. When asked a simple question about one of the wines on the list our waiter passed us off to another staff member, who looked impeccable in his suit. But when asked the same question about the same wine he answered by pointing out the Monte Antico IGT 2006 on the list with the comment that it is a nice wine that is quite bold. Duh, if I wanted to know that, I would have asked. Third time lucky, I enquired again about the Tenuta Del Ornellaia Le Serre Nuove 2007 hoping to find out what grape variety this “Super Tuscan” is based on. Alas, after pointing out yet another bold little number on the list and failing to deflect the question he said he would bring the bottle out, he missed me rolling my eyes! Being an Italian wine the grape variety was nowhere to be found on the bottle, the question remained unanswered, though it was a very nice looking bottle and label, which I dutifully reported to our smartly dressed waiter and then ordered a bottle of the Argiano Brunello Di Montalcino 2006. 2 Funtastico – the Beef Cheek Ravioli is a special not on the Menu, try it! Drunk over 3 days, sealed after the first day then sealed with a wine saver (argon gas) after the second day. Colour, incredibly pale straw with a tinge of green, looks like a good Chablis. On the nose and palate it was a lot softer and subtler than expected, I had sampled their Gimblett Gravels Vineyard Chardonnay 2009 previously, see my notes here*. This is a much more complex wine that will require some additional bottle age as it was showing much more on the second day. Beautiful pear and apricot fruits on the nose with just a hint of citrus and some smokey oak coming through, at 13% the alcohol doesn’t overpower. The palate has a mouth filling smooth (oily in a good way) feel that carries the fruit over the mid palate blending it with a touch of honey and finishing with a bit of an acidic kick that helps hold together a very long finish. Only two more bottles in the cellar and they will need to wait, will be added to with a few new vintages each year as this is a great wine, in a style that has a blend of a Chablis 1st Cru and a Meursault 2 to give it that beautiful rounded feel. Purchased at the winery while in New Zealand $58.00 in a mixed dozen. BTW congratulations to the All Backs for winning the Rugby World Cup, for a while I thought the French were going to roll them. The Gardener was over with friends on Saturday night and brought this gem with him, this is his take on purchasing the wine and subsequent events. It was well worth swapping the 2008 for an 04 as the 04 has grown as a wine and is drinking superbly with lots of dark red fruit, oak and forest floor notes on the nose. Followed by a rich silky smooth palate that packs a punch that even a Shiraz drinker can’t ignore, flavours of dark berry balanced with a long savory finish, the bottle did not last long only one left in the cellar. Also drunk on Saturday night. From a good producer and a great vintage, you can’t go wrong and it’s not a Howard Park. 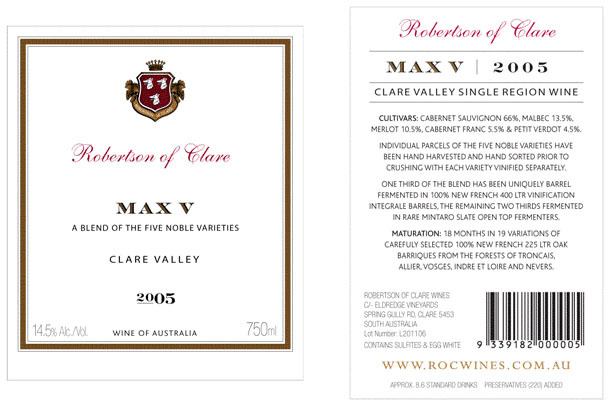 This is my idea of what Margaret River Cabernet Sauvignon should be at this price level. Drank with dinner, BBQ’d roasted pork loin on the bone with crackle served with a garden salad and a cold pesto and rice salad. Being a big earthy wine bound up with a good amount of oak, that is still hiding some of the fruit, it suited the meal without overpowering it. Probably should have been decanted to let some of those dark and red berry flavours too emerge more into their own. Supplied by JA retails for around $70.00 if you can find it. It's a good looking label, but! We had an enjoyable Sunday afternoon over at Acepfv’s house were Cookie brought over a bottle of Pinot Noir from Denmark in the Great Southern region of Western Australia, the winery was unknown to all of us and if one relied only on the information on the back label, you would be expecting something exceptional. Here is the blab. This premium Pinot Noir displays alluring aromas of vibrant red cherry, layered with a subtle earthiness and notes of spice and vanilla. Seductive flavours of concentrated red berries marry with a rich and spicy mid palate of mocha and toasty oak, that lead to a long and finely textured finish. Now, for what we actually drank. First reactions, cookie looked like he had drunk cod liver oil with the comment “I don’t like that, too much alcohol” it’s 14%. Both Acepfv and myself thought it was thin and lacked depth. I think Acepfv would have been thinking “see what I mean, Pinot Noir it’s limp where’s the grunt, haven’t I been telling you this for ages”. Even on reflection after tasting this wine over two hours on Sunday and again on Monday afternoon, one has to say it doesn’t live up to its own blab. It’s as if they have written what they want the wine to be, not what it is. The nose and palate lacked depth. There was none of the earthiness, spice and vanilla on the nose just a hint of that typical Pinot red cherry and none of the silky texture in the mouth and definitely no long finish on the palate. The best I can say is that it’s not offensive and if it sold for $20.00 a bottle it would be passable on a price/quality value, as it does display pleasant but very light pinot flavours. From the wine room, cellar or whatever one should call it, this wine is starting to hit its straps, it is amazing what a couple of extra years in the bottle can achieve for Chardonnay. This has now lost some of its bright acidity, which was dominating the wine when it was first released. Also the toasty oak and fine tannin has now integrated with the zesty lemon citrus fruit flavours giving a more complete mouth feel and flavour experience. The truly good thing is there are more than a few bottles left in the cellar, so I don’t have to worry about being sparing with this wine, may even knock off another bottle this weekend. Have had a couple of bottles from this vintage now and have to say it is a corker of a wine, great drinking now with a palate that stretches from lemon citrus to honeysuckle with a huge and long finish, a timeless classic that can only get better. Something I was looking forward to, as it is the first time drinking this wine, unfortunately it may have been the occasion or maybe even a slight amount of cork taint, but there was something on the nose that was just not right which I could not pick, it also lacked freshness on the palate and lacked fruit on the nose. Disappointing. To compare here are James Hallidays notes. Tasted nothing like how James Halliday described this wine, it lacked the silky tannins and the sweet red fruits never surfaced. In hindsight, should have sent it back, but as I had not had it before and whatever was on the nose could not be referenced back to something obviously wrong, I didn’t. In later discussions, the Gardener disagreed with my assessment just commented that it was expensive for what it was and wasn’t.